414 pages; 8.5" x 11"
Calling the Game: Baseball Broadcasting from 1920 to the Present is an exhaustive, meticulously researched history of bringing the national pastime out of the ballparks and into living rooms via the airwaves. Every play-by-play announcer, color commentator, and ex-ballplayer who has presented a Major League Baseball game to the public is included here. So is every broadcast deal, radio station, and TV network. In addition to chapters for each of the game's thirty franchises, a history of national broadcasting and a look at some of the game's most memorable national broadcast moments are included, as are a foreword by "Voice of the Chicago Cubs" Pat Hughes, and an afterword by Jacques Doucet, the "Voice of the Montreal Expos, 1972-2004." Each team chapter presents a chronological look from how and when the team began broadcasting (since all of the original sixteen major-league franchises predate radio) through the 2014 season. Author Stuart Shea details the history and strategies that shaped each club's broadcast crews, including the highlights and scandals, the hirings and firings, the sponsorships and corporate maneuverings. From the leap to Brooklyn from the radio booth of the Atlanta Crackers by young Ernie Harwell, to the dismissal of Mel Allen by the Yankees, from the tutelage of the now-legendary Vin Scully under the wing of the already legendary Red Barber, to the ascendance of the great Jack Buck to the number one chair in St. Louis upon the ouster of Harry Caray, the stories of the personalities who connect us to the game are all here. Calling the Game is a groundbreaking and illuminating look at the people and the story behind the soundtrack of summer for millions of baseball fans. About the Author: Stuart Shea has been writing professionally about baseball for more than 20 years and has authored or co-authored nine books about the game, including Wrigley Field: The Long Life and Contentious Times of the Friendly Confines (University of Chicago Press). He served as editor of Fantasy Baseball Index for four years, worked as an MLB.com game reporter for a decade, and co-created the successful FAQ series of music and entertainment titles for Backbeat Books. A proud SABR member, he lives in Chicago. E-book: Click here to download the e-book version of Calling the Game: Baseball Broadcasting from 1920 to the Present for FREE from the SABR Store. Available in PDF, Kindle/MOBI and EPUB formats. Paperback: Get a 50% discount on Calling the Game: Baseball Broadcasting from 1920 to the Present paperback edition from the SABR Store ($15.99 includes shipping/tax). 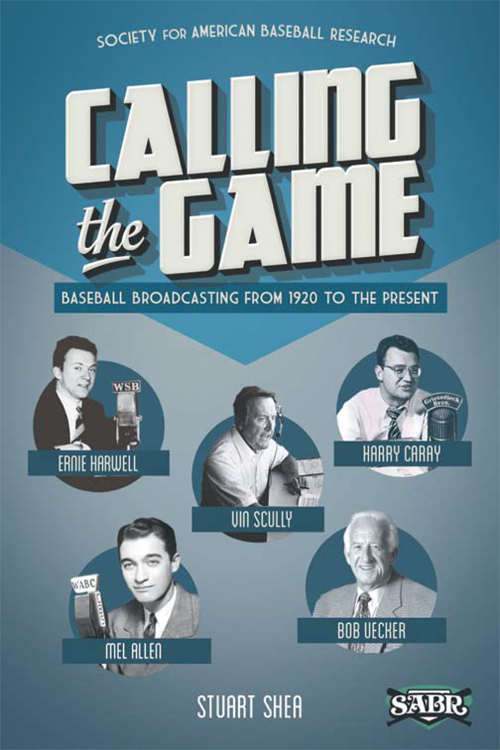 E-book: Click here to purchase the e-book version of Calling the Game: Baseball Broadcasting from 1920 to the Present for $9.99 from the SABR Store. Available in PDF, Kindle/MOBI and EPUB formats. Paperback: Get the paperback edition of Calling the Game: Baseball Broadcasting from 1920 to the Present from the SABR Store ($30.99 includes shipping/tax). For more than 40 years, SABR and its members have led the way in publishing the best baseball historical and statistical research. Our publications program is shifting to take advantage of new methods of publishing. Not only will we continue to publish new books like Can He Play? A Look At Baseball Scouts and Their Profession (released in December 2011); Opening Fenway Park in Style: The 1912 World Champion Red Sox (May 2012); Detroit Tigers 1984: What A Start! What A Finish! (December 2012); Sweet '60: The 1960 Pittsburgh Pirates (April 2013); Inventing Baseball: The 100 Greatest Games of the 19th Century (July 2013); Thar's Joy in Braveland: The 1957 Milwaukee Braves (May 2014); Detroit the Unconquerable: The 1935 Detroit Tigers (December 2014); and Winning on the North Side: The 1929 Chicago Cubs (February 2015), which showcase the best efforts of SABR's members, chapters and committees, but new technology makes it possible for us to bring out-of-print titles like Run, Rabbit, Run: The Hilarious and Mostly True Tales of Rabbit Maranville (February 2012), Great Hitting Pitchers (March 2012), Nineteenth Century Stars (August 2012); Batting (January 2013); The Fenway Project (September 2013); and '75: The Red Sox Team That Saved Baseball (April 2015) back again. This page was last updated October 31, 2017 at 7:29 pm MST.